Now available for preorder at B&H Photo. 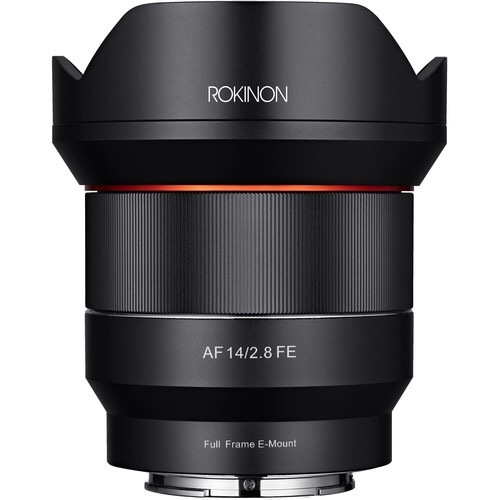 Expand your imaging capabilities with the ultra-wide-angle view provided by Rokinon’s AF 14mm f/2.8 FE Lens for full-frame Sony E-mount cameras. This optic is quite fast for its class with an f/2.8 maximum aperture which will help users work in low-light conditions. It also incorporates three aspherical and two extra-low dispersion elements to reduce aberrations for clean, sharp images. It also uses an Ultra Multi-Coating and integrated lens hood to minimize the impact of flare and ghosting in your photographs. The lens offers an autofocus motor optimized for use with Sony cameras to provide fast, accurate performance and it has manual focus override for making tweaks in any AF mode. Additionally, the lens features a rounded 7-blade diaphragm for smooth out-of-focus elements. Blending an ultra-wide angle of view with a relatively fast f/2.8 aperture, this 14mm lens makes a great option for Sony shooters looking to get a unique perspective that is well suited to architecture, landscapes, and more. Two extra-low dispersion glass elements work to reduce chromatic aberrations; improve overall image sharpness, clarity, and color fidelity; and help to minimize the overall weight of the lens. The integrated autofocus motor works in conjunction with Sony cameras’ focusing systems for quick, accurate, and precise AF control. Manual focus override is also available for refining your focus position. This entry was posted in 3rd Party Lens and tagged Samyang AF 14mm f/2.8 FE. Bookmark the permalink. Trackbacks are closed, but you can post a comment.